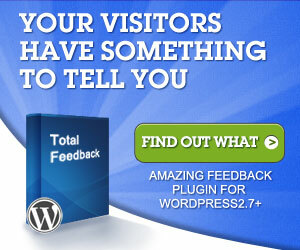 Total Feedback is a premium WordPress plugin that helps you to gather and track feedback from your website visitors. You can manage multiple polls, view poll analytics and text responses and control the exact timing of polling your visitors. Unlimited Polls – Create unobtrusive polls that help you understand your visitors better. Poll management – A full-featured administration panel inside WordPress for managing your polls. Poll analytics – Eliminate guesswork by using real visitor data. Control the timing of polling your visitors with various options for maximum results. Free-text responses – Let your visitors fill in the blanks and tell you exactly what is going on. Data is stored on your server – making advanced usage and inspection possible if required.